View photo show of Van Leer & Wayne Pennsylvania sites. Samuel Van Leer was born in 1747. His mother died 2 years later, and his father Bernardhus Van Leer remarried Christianna Fuls in 1750. Samuel was, then, predominantly reared by his step-mother in the large house in Marple Township. His grandfather was the wealthy investor, William Branson, who lived in Philadelphia and owned the iron furnace in East Nantmeal (Reading Furnace). Mr. Branson died in 1760, having outlived 3 of his 4 daughters. His estate went to his daughter Elizabeth and the 15 grandchildren from the other 3 daughters. A nearby neighbor was Isaac Wayne, son of the Battle-of-the-Boyne veteran. While Samuel's father, Bernardhus Van Leer, and Isaac Wayne witnessed many documents together, it is doubtful that the proud tee totaling Bernardhus and the fist-fighting Isaac were close friends. Another neighbor, in East Caln Township, was the Culbertson family descended from a Wayne army-buddy and comrade of the Battle of the Boyce. who married the Pennsylvania Van Leer's played an important role in the family history. The couple first lived on a Wayne farm on Church Road beside St. David's in Easttown Township (View Photo). Five children were born in this home before the Revolution. Samuel served on the vestry of St. David's from 1773 until 1775 when he volunteered his services in the Pennsylvania militia. The war years were very tumultuous years for the Van Leers. Captain Samuel's involvement with the Revolutionary cause was extensive. Three large farms in Easttown and Marple townships had to be managed. Simultaneously, he started putting together a complex iron manufacturing business. His grandfather, William Branson, had pioneered the American iron industry and put together a highly successful business. Since Branson's death, the business had been divided up among 15 heirs. The largest furnace, Reading Furnace, was leased out during the Revolution to James Olds. It was Mr. Olds who entertained George Washington in 1776 and who filled the army's orders for cannon and shot. Hannah and the five children moved to the Reading Furnace Mansion in 1780--during the Revolution. [View Photo] A sixth child was born in 1783 at Reading Furnace. A set of twins, born in 1786, completed the family. Hannah died soon after giving birth to the twins. I but too feelingly sympathize with you, on the death of my ever dear Sister Hannah - but it is a debt that human nature must at one day pay, the time and manner is all - her helpless Orphans will experience the greatest loss. He is happy and thinks not of them, eased from all worldly cares, her immortal soul, rests in the Mansions of the blest. Mother, mourn not for her - but let us turn our thoughts to the protection of her little children. My sister Hayman will take one or two, Polly - will take two or three more, the two largest boys, Mr. Van Leer ought to keep at School - but Betsy is arrived at that age, in which the advice of a female friend and Protector, is essentially necessary - let her by all means, be taken from Reading either by Nancy or Polly and treated with the same care and attention as they would their daughter at that period of life. N.B. Present my kindest and best wishes to Sister Nancy, Captains Van Leer and Hayman. Samuel, however, did not distribute the children among the relatives. All were kept with him at the Reading Furnace Mansion. He did not remarry. All the children were well educated and the daughters married well. In adulthood, however, there was considerable friction among the sons. Samuel Van Leer welcomed the Revolution with enthusiasm. In the latter part of 1775, both Samuel and his brother-in-law, Anthony Wayne, were negotiating for commissions in the impending conflict. A letter from Col. Charles Lukens at York, dated December 27, 1775, is addressed to Col. Wayne (a "colonel" in the state militia) in answer to a letter delivered by Samuel Vanleer, Esq. at York. In the letter, Wayne was requesting to be recommended to an honorable military command. Col. Lukens replied that Congress had ordered four battalions to be raised in the province of Pennsylvania, and that he would do all he could, but since many were applying, he advised that both Wayne and Van Leer petition directly for a command "in the Glorious Cause." The tremendous influence that the Wayne family had on the Van Leers is evident in Samuel's enthusiasm for the military. Unlike the Waynes, the Van Leers were not a military family. The last evidence we have of Van Leers in the military was the battle of Grandson 300 years past--1476. Since then, Van Leers had been pastors, churchwardens, pharmacists, doctors, etc. Starting with Samuel, all the Van Leers were active in the state militia and proudly used their "Captain" titles. Descendants are repeatedly named "Anthony," "Wayne," "Isaac," and "Hannah." Van Leer's first commission, though not found, is vouched for by a receipt dated August 16, 1776, for "Fifty-two pounds Fifteen shillings in part pay of my Company," and by a notice in the Pennsylvania Gazette, September 10, 1776, relating to deserts from his company. 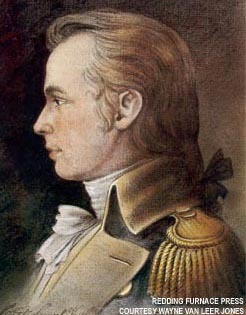 His second commission, May 17, 1777, as Captain of the Seventh Company, Fifth Battalion of the Chester County Militia, is found in Revolutionary War records, Washington, D.C. and the Pennsylvania Archives. Van Leer served at the Battle of Brandywine, was with Wayne on the fateful night of the Battle of Paoli (known as the "Paoli Massacre"), September 20, 1777, and took part in the Germantown campaign. In 1781, he was a lieutenant of a company of Light Horse Volunteers commanded by Captain Alexander Johnson and rose to captain of this unit in 1785. The Light Horse Volunteers was a small, select group that performed reconnaissance. Good horsemanship was essential. The horses were well trained, fast, and dark (for stealthy night time activities). Only established Americans were accepted; recent immigrants were considered a security risk. Light Horse units were organized under Continental authority and were completely under Washington's control. Samuel's character is illustrated in a letter written by his grandson Isaac W. Van Leer. (Isaac W. Van Leer was the son of William Van Leer). We see his devotion to duty and dedication to the cause of the Revolution in that he agrees to collect provisions from his neighbors for the Valley Forge forces. But his gentler nature is shown in that he does it "sorely against his will." Bill-collecting is actually beneath his dignity and he isn't really comfortable using force against his neighbors. "...When the army was starving at Valley Forge, my grandfather was sent out in command of a party (sorely against his will) to collect provisions peaceable if he could, forcibly if he must; the duty was put on him because he knew the people, and where there were provisions to be found; and within my recollection there were families, that had not yet forgiven him for it." "He [Grandfather Samuel Van Leer] related an affair that occurred whilst the army was encamped at Valley Forge, he and some other officers were sitting in Wayne's quarters when an orderly came in who said a soldier had been killed by Devault Beaver (Beaver was a farmer reciding [sic] in the vicinity) and that when brought into camp he did not deny it, but said it was Gen. Wayne's orders; it appeared that some of the men of Wayne's regiment had been in the habit of milking Beaver's cows; the men had been threatened with punishment if detected, but the cows continued to lose more or less milk, and their owner every few days in camp making complaints; on the last occasion Wayne was riding out of the camp, when Beaver called after him "General, what am I to do, the cows were robbed again last night?" Wayne, who by this time, had begun to lose patience said 'shoot the rascal;' of course, never supposing he would be taken literally, but Beaver took him at his word, kept watch, and a few nights after seeing a soldier sitting by a cow milking, shot him dead. As Wayne had to acknowledge his hasty reply, Beaver was released." Samuel purchased the Branson furnace farm back piece-by-piece from the various heirs, sometimes going through a third party--Rutter & Potts. By the end of the war, Samuel had reacquired the property and made extensive improvements (e.g. larger dam, a second furnace). Samuel took over active management of Reading Furnace sometime in 1786. Anthony was named as a partner in each of the companies. Samuel seems to have financed all these enterprises. Things were going well for Samuel and Reading Furnace until 1807 when a disastrous flood tore out the dam breast at the forge. The flood was, then, followed by a more personal loss in 1808. Samuel's son William died leaving a widow (Sarah) and three children. William's medical expenses, which were paid by Isaac, indicate a protracted illness or injury. The "Vanleer Papers" conclude that William was injured during the flood. Actual money was scarce on an iron plantation. "Their wealth lay in their land equity as well as their product, and profits were frequently poured back into the establishment. William's death required a liquidation of family assets to provide for the widow and children unless they were willing to become charges of the family largesse. "Apparently, Sarah was not so willing." Cremers, Estelle: Reading Furnace, 1736. The only way Samuel could safeguard the other sons' new business ventures was to sell Reading, the older and more saleable investment. Reading was put up for sale, but had not been sold by 1810. Apparently Sarah's patience was at an end. Sarah along with Anthony and Bernard brought an action against Samuel, their father, which set in motion a sheriff sale of the Reading Furnace property. It was sold in 1812 as a farm. There were numerous other suits and counter-suits as Bernard and Anthony set about raising money to start operations in Tennessee and Isaac struggled to keep the Pennsylvania operations open. Relationships among the 3 brothers is discussed more under Generation 9 - Isaac Van Leer. The iron industry of Tennessee is discussed under Generation 9 - Anthony Van Leer. Samuel Van Leer died in 1825. Four of his eight children had preceded him--William in 1808, Isaac in 1822, Mary in 1820, and Hannah in 1822. Only two daughters remained--Elizabeth, the oldest daughter, and Ann. His last will and testament was given orally just before he died at his daughter's--Ann Templin. His final will reflected his disaffection with his remaining sons in that he explicitly stated "nothing goes to my sons." ..."I wish all my property to be divided among my four daughters, Betsy, Mary, Hannah and Nancy unless Leedoms children bring anything against me, then they are to have nothing." He afterwards said "I wish all my personal property sold and divided among my four daughters..."
And on being asked if he wished his wearing appareal sold, he said "No....My sons are to have nothing." And further he said "I wish you to take notice that this is my will." His statement about "Leedom" refers to Mary's husband. Her husband, John Leedom, had investment interests in the Vanleer forges. If the Leedom children also sued him, he wanted them cut out of the inheritance also.